This species is accepted, and its native range is Canada to NE. Mexico, Caribbean. Annual; caespitose. Culms erect, or geniculately ascending; 20-80 cm long. Culm-nodes bearded. Leaf-sheaths hispid; with tubercle-based hairs. Ligule a ciliate membrane. Leaf-blades linear, or lanceolate; 7-30 cm long; 5-14 mm wide. Leaf-blade apex attenuate. Inflorescence a panicle; deciduous as a whole. Panicle open; oblong, or ovate; effuse; 15-50 cm long. Panicle branches capillary. Spikelets solitary. Fertile spikelets pedicelled. Spikelets comprising 1 basal sterile florets; 1 fertile florets; without rhachilla extension. 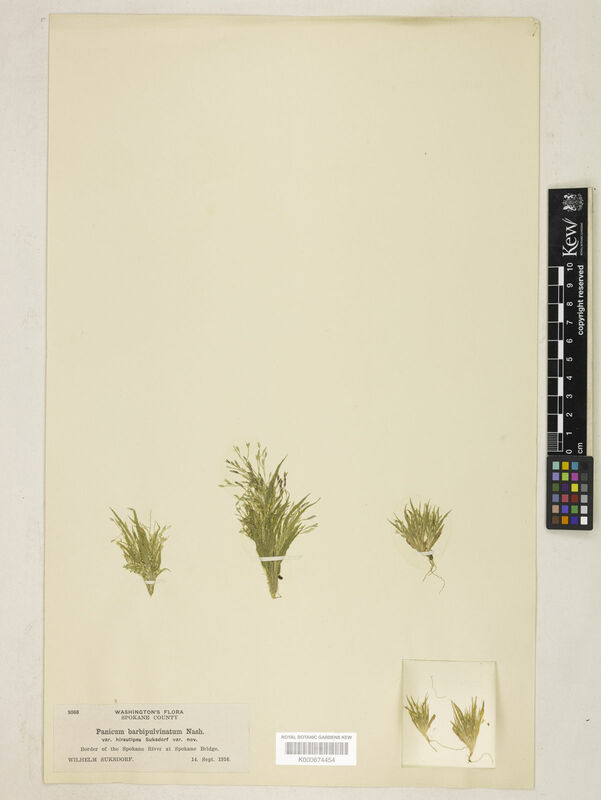 Spikelets elliptic, or oblong; dorsally compressed; acute, or acuminate; 1.8-2.5 mm long; falling entire; deciduous with accessory branch structures. Glumes reaching apex of florets; thinner than fertile lemma. Lower glume ovate; 0.33-0.5 length of spikelet; membranous; without keels; 3 -veined. Lower glume apex obtuse to acuminate. Upper glume ovate; 1 length of spikelet; membranous; without keels; 5-7 -veined. Upper glume apex acuminate. Basal sterile florets barren; with palea. Lemma of lower sterile floret similar to upper glume; ovate; 1 length of spikelet; membranous; 5-7 -veined; acute. 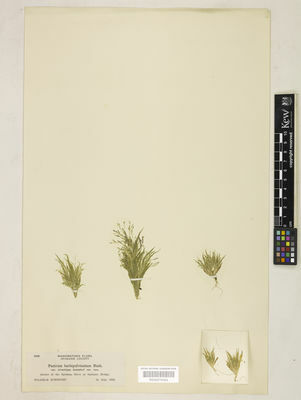 Palea of lower sterile floret 0.5 length of lemma. Fertile lemma elliptic; dorsally compressed; 1.5 mm long; indurate; pallid, or yellow; shiny; without keel. Lemma margins involute. Lemma apex acute. Palea involute; indurate. Europe: central, southwestern, southeastern, and eastern. Africa: Macaronesia. Asia-temperate: Soviet far east, Caucasus, and western Asia. Asia-tropical: India. Australasia: Australia and New Zealand. Pacific: southwestern. North America: western Canada, eastern Canada, northwest USA, north-central USA, northeast USA, southwest USA, south-central USA, southeast USA, and Mexico. South America: Caribbean and southern South America. Panicum acutifolium Willd. ex Spreng. Panicum barbipulvinatum var. hirsutipes Suksd. Panicum capillare var. agreste Gatt. 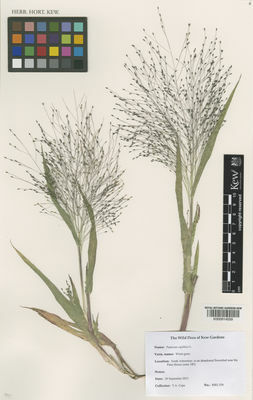 Panicum capillare var. vulgare Scribn. Nobis, M. & al. (2017). Contribution to the flora of Asian and European countries: new national and regional vascular plant records, 6 Botany Letters 164: 23-45.